The holiday voucher is handed over at reception. Tea and scones are available. In the room a fine tassel hangs from a wardrobe key. 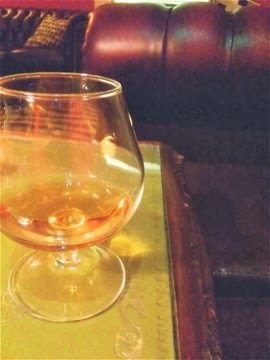 Complimentary sherry in cut glass. Sash windows overlook carved owls, flagstones, lawn, curls of distant cloud. A walk next: an exploration of Brent Knoll's steep gradient. Curiosity is a great propellant. The sky gods: feisty, buffeting, sending footprints off at quirked angles. At the summit are craters, a grassed over moon surface. A 360 view spins, right to left, left to right, until it gets dizzy. Path is a slipway of mud and water. A brook bubbles up and all the way back down to earth and a warm country hotel. There is chintzy print and lampshades strung with beads. 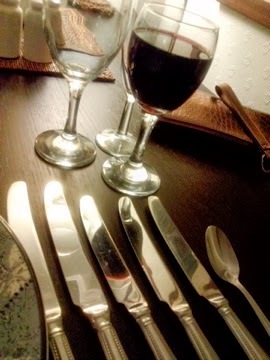 Yes, lampshades wearing jewellery: seven courses on the taster menu; liberal use of balsamic: merlot unbottled, lemon cleansed palates, fat bottomed brandy glass, cutlery shining in low light. A room full of color and comfort! I can feel it from here. Curiosity is a great propellant, I concur. Must remember that in times of flatulence --sounds more excusable. 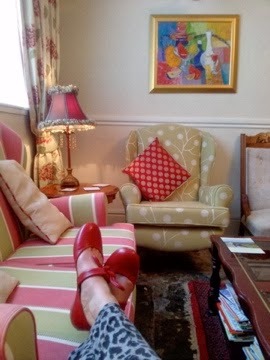 I love the red shoe/leopard print combination as well.